Carroll's Early Access allows high school juniors and seniors to start their college experience and career path now. Registration begins August 7. Registration for Spring 2019 classes is now open. Register online here. HELENA, MT – Carroll College has announced a new high school initiative – Carroll Early Access – offering tuition-free college classes to high school students. In partnership with schools in the Helena area, Carroll College is offering the opportunity to high school juniors and seniors to enroll in college-level courses taught on campus beginning this fall. “Through this program, Carroll College seeks to provide an authentic college experience to our local students,” said Carroll College President Dr. John Cech. 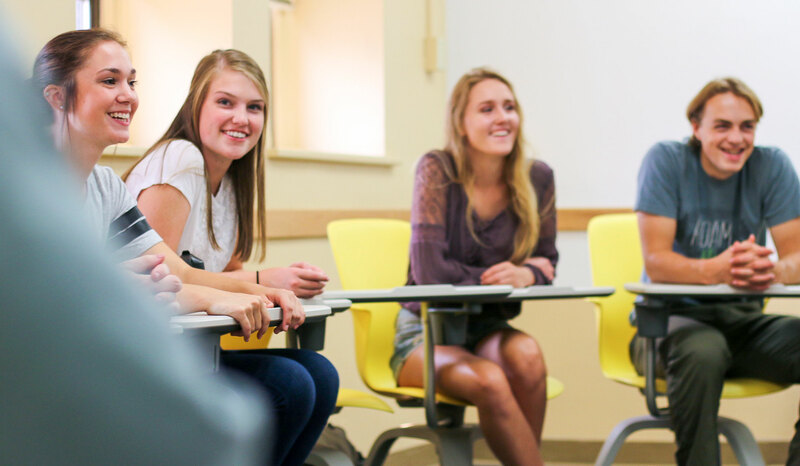 “By providing the classes tuition-free, we hope to remove barriers to higher education so students can experience what it is like to attend college and get a head start on their college career while still in high school.” All classes are taught by Carroll College faculty on the Carroll campus and include current Carroll students. Students are able to take up to two classes per semester from the approved course list which can be found on Carroll's website at carroll.edu/earlyaccess. The majority of courses are three credits while those offering a lab component are four credits. Students who complete the courses will receive Carroll College credits, which can be used to pursue a future degree at Carroll or transferred to another institution. While tuition is free, there is a nominal $60 student fee per semester and some classes have an additional course fee (such as labs) to cover supplies. In addition to these fees, students are responsible for the purchase of their own books and supplies. A distinct benefit of the program is having the opportunity to acquire up to eight classes of college credit prior to graduating high school resulting in potentially significant college tuition savings. "We understand that one of the major barriers today’s students have to obtaining a college degree is cost," said Cech. "Providing them with the opportunity to acquire up to a year’s worth of college credits tuition-free, gives students a valuable advantage to graduate college in three years. By entering the workforce or graduate school earlier, early college enrollment provides a pathway for students to begin their careers sooner resulting in potentially higher lifetime earnings." Above L-R: Helena Public School Assistant Superintendent Josh McKay, Helena High School Principal Steve Thennis, Helena Public School Superintendent Jack Copps, and Carroll College President Dr. John Cech announce the creation of the Carroll Early Access program on June 29, 2018. Capital High School Principal Brett Zanto was part of the partnership but unable to attend. "The Helena School District has always enjoyed a special partnership with Carroll College," shared Superintendent of Helena Public Schools, Jack Copps. "And today Carroll has strengthened that relationship by providing juniors and seniors in our schools an opportunity to attend both Carroll and their high school at the same time. I am deeply grateful to Carroll for this extraordinary moment and hope students and families take advantage of this opportunity." Students enrolled in the program will be issued a Carroll ID that will provide access to Carroll’s Corette Library as well as Carroll home athletic and performing arts events. Students will also be invited to attend lectures and other academic events available to all Carroll students. In order to enroll, students will sign up for admission to the Carroll’s Early Access program through their high school counselor, who must approve their application. Once the application is signed by both a high school official and a guardian for the student applicant, the application form along with the classes they are enrolling in will be submitted to the Carroll College Admission Office by the counselor. Students are required to have a GPA of 3.25 to enroll in the program. It is important to note that this is a new program, which is in addition to Carroll’s “dual enrollment” program. Dual enrollment is a course taught in the student’s high school by a high school teacher with college credit given for the class through an agreement with the college. Carroll has dual enrollment programs in mathematics and computer science at Capital, Helena, St. Andrew and Loyola (Missoula) high schools. Carroll College is now matching the Montana University System rates for dual enrollment courses at $50 per credit. Registration for the Carroll Early Access program will begin August 7 and an open house will be held on the Carroll College campus that day. Both Helena Public Schools and Carroll staff will be on hand to answer questions about classes, scheduling and registration. Details regarding the open house will be available at carroll.edu/earlyaccess. To learn more about Carroll’s Early Access program, visit carroll.edu/earlyaccess.